Guess what day it is? Yep.. It's Wednesday and time for a another Hambo Hoedown challenge! 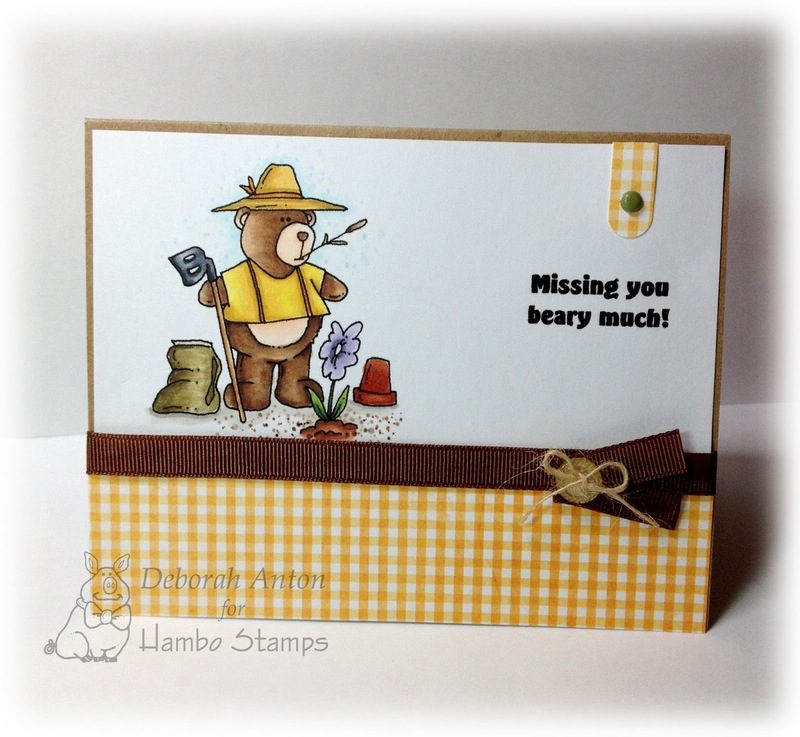 This weeks darling Hambo Stamps image is Bear Farmer. He colored in with Copics and is on one panel together with one of three sentiments it comes with. 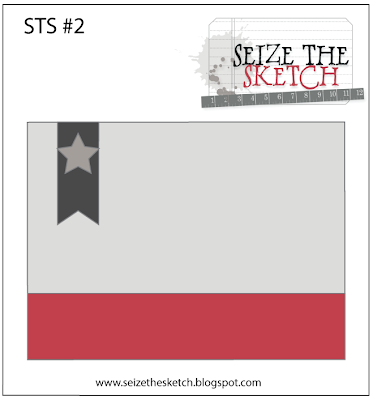 I used this weeks Seize the Sketch for the layout. The bottom layer is a some scrap dp I had and I used the coordinating paper for the top strip which I punched out and folded over. A brad was used in place of the star. CAS sketch and was perfect for this image! We hope you play along and if you do, don't forget to link up for your chance at being the Queen of the Hoedown and to receive your free digi! Thanks for popping in and hope you have a great Wednesday! It's another Tuesday and that means another Flourishes Timeless Tuesday challenge! I am your hostess this week and my challenge is to be in distress! That's right... distress your card or project using anything to make it look in distress - distress inks, edge distressers, sandpaper, or anything else you are creative in using to make it amazing! For my card, I went with the traditional edge distressing and was inspired by Christine Okken's style of this new release called Mountain View which you can see here. Although I didn't quite make it as striking, my technique was just trying variations of it. I did distress the edges of each layer and folded the corners on the middle and strip layers. I used some paper from 7Gypsies for a more masculine look from their Off the Wall collection. I popped up the image and added the sentiment underneath that before finishing it with some black and cream jute twine. The image was colored in the following Copic colors and Flourishes Classic Cream Cardstock was used for the base and image. Come play along and be sure to link up your creation for a chance to win! Thanks for stopping in and taking a peek!! I thought I would start today sharing with you a new sewing project that I tried - making a cute checkbook cover. Now, I am no seamstress (so don't look closely if you are...) but this was simple enough that I would say a beginner could do it. I think it came out pretty cute and it makes whipping out your checkbook better. Er... um... ok, not really because you still have to write the damage anyway, but it will look nice! :) I did not make this a tutorial because I really don't know how many would be really interested in it, so let me know if you do and I will be happy to make one. Thanks so much for stopping by and hope you have a great Monday! I thought I would start the weekend by doing a little giveaway showing off a darling company called PatchMommy. They specialize in super cute iron on's for that perfect gift needing a special touch. This is a cotton bag that can be used for makeup, baby things, or this and that's. Sorry this picture seems grainy on the bag, but I assure you its not. I couldn't get a picture that didn't look like wood grain throughout! lol! All you have to do to win is like my FB page here and comment on the page. That's it! A random winner will be picked tomorrow morning! Good luck! It is never easy losing someone you love unexpectedly, but it happens. And it recently happened to a sweet friend when her father passed away. This is a card I made for her and I am hoping the simple message on the front will soothe and calm the pain that she and her family are feeling. I wanted this to be simple and elegant with not a lot of "fluff" because really, it's your sympathy you want to convey, not how fancy you can make the card. I used some cs from PTI in Spring Moss for the base and some black cardstock from Lilly Belle for the main layer. I ran the black cs through a CB folder to emboss the background, and I did it in two runs since this card is a 5.5"x5.5". I then used my Flourishes Perfectly Pierced hourglass die to create the top layer with the sentiment stamped directly on that using Memento Black. That is popped up. I finished the card with some sheer 1.5" ribbon tied in a bow using The Bow Easy and I added some paper flowers to the center. I then used two bronze pearls to add to the straight ribbon. Thanks for stopping in and have a great rest of your Thursday! We start Fall baseball tonight, so my schedule got fuller. :) It's almost Friday!! Some of you may be headed back to school this week, so todays Hambo Hoedown project is perfect pick me up for your student. (or teacher) This weeks image is School Dog and the challenge is to use one or more school themed item in your card or project. For my project, I used a glassine bag from SRM Stickers to hold some pencils tied with some twine. The image was colored in with Copics and spotlighted with my nesties before cutting it out to be popped over the labels nestie used. I added some fun Prima washi tape to the bottom and added some chipboard accents for some added elements to pop. 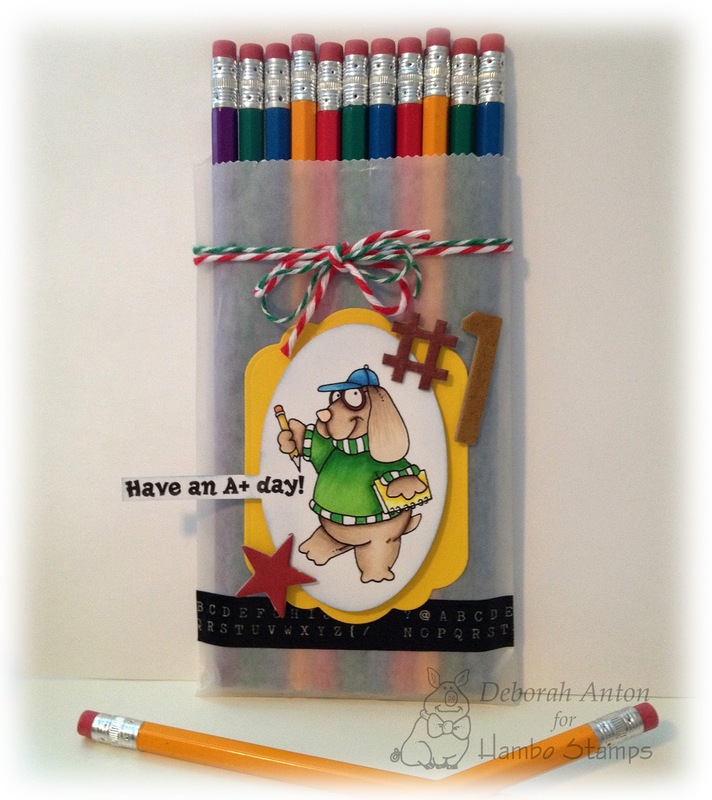 A simple and cute way to give some plain pencils for school! Be sure to stop by and check out the other fabulous projects from the Bacon Bits and while you are at it, whip out some school items and play along! You can get your free image and a chance to be the Queen of the Hoedown! Thanks for popping in and taking a peek! Have a great Wednesday! Judy is our fabulous hostess this week and she is challenging you to use doilies in your card or project! Doilies have been hot for a while and it is rather timeless in using them for beautiful projects. 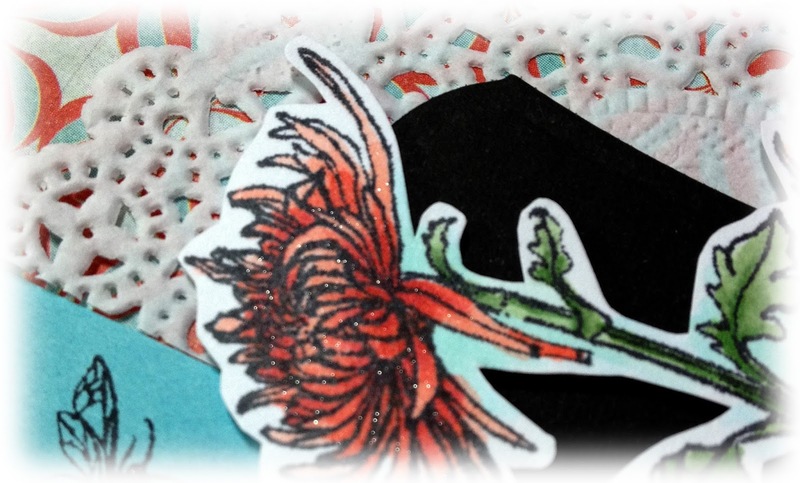 For my card, I used this months Flourishes release of Chrysanthemums. Such a beautiful set with beautiful sentiments to match. Thanks so much for stopping by today and hope you will play along for your chance to win! Be sure to stop see what other fabulous designs the team has put together! Have a great Tuesday! I hope you all had a nice weekend and ready to tackle on another week! I got to start this morning off by helping in my kids class for 2 1/2 hours filing papers. I am now crossed eyed... But someone has to do it! Those teachers have enough to do and a lot of kids to grade papers for. So, I am happy to do my part to make their job just a little easier. I have a quick card to post- one that was made for our fabulous coordinator at Flourishes, Julie Korber. She does so much for so many of us on the different teams and she seems to never complain. Well, at least for us to hear or see! :) It was a small gesture to thank her for all she does on a daily basis to keep the teams moving smoothly. I used Flourishes Inside and Out - thank you set and some Color Made Easy ivory seam binding for the ribbon. 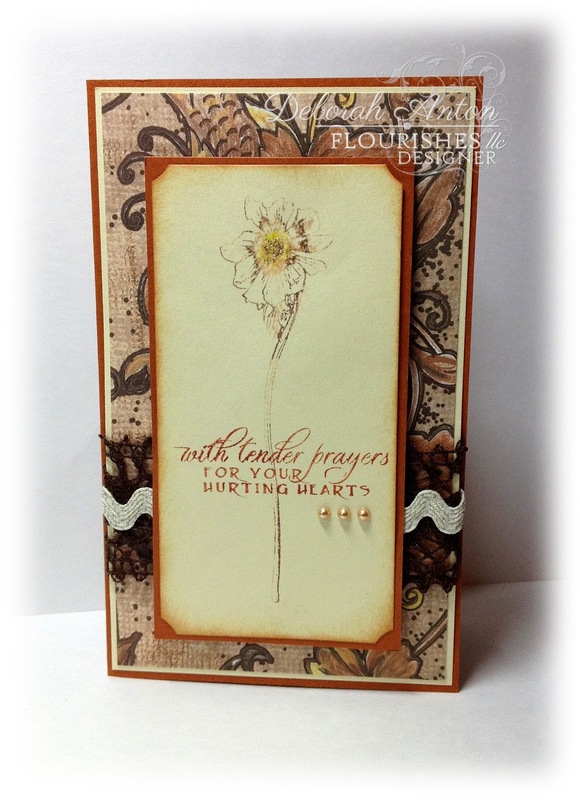 The paper is one I had in my stash by Daisy D and coordinated that with some Flourishes Classic Cardstock in Ivory. I used my nesties to cut the circle for the sentiment and cut it to make it side up with the card. I finished it off with some rhinestones and a flower in the center of the bow. The inside is finished to match. I am also using this post today to thank you all who have come to like my Facebook page and shared the page with others!! You all rock! Thanks for popping in and I hope you have a great rest of the day!! No, it's not the beginning of a bad joke... :) It's Wednesday so it's time to Hoedown!! 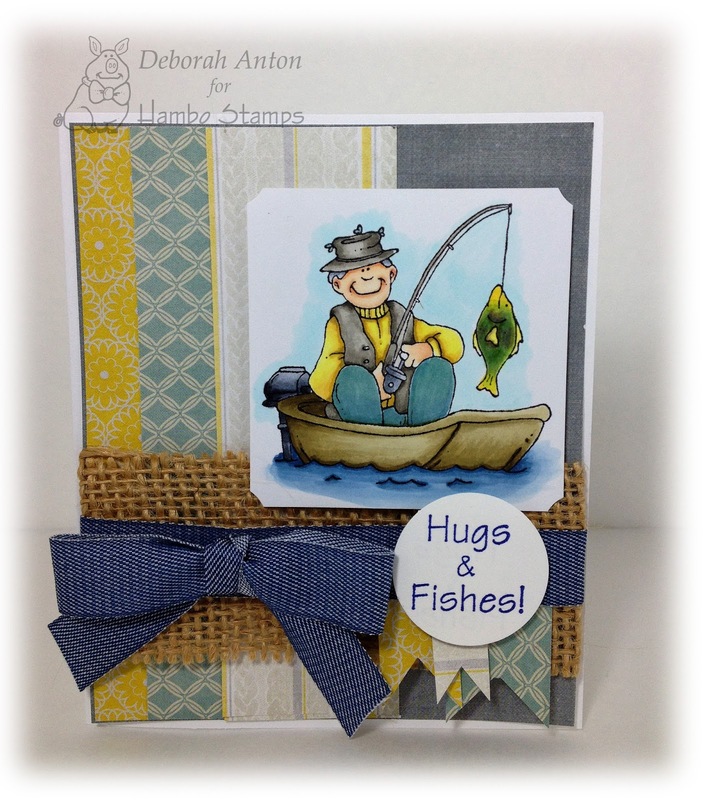 This week's fun challenge is to incorporate an item or two into your card or project that a carpenter would use. Ruler, wood, those fun screw brads, etc. This was a perfect challenge for me to use the fun screw brads I feel like I have had forever. I guess I should find more uses for them. What you can't see here is my wood grain paper on the back panel. I used some dp from Basic Grey's Granola collection before popping up the panel with my Carpenter image and sentiment up over it. I used those fun screw brads on the corners and colored this handsome man with Copics. I added a little 5 o'clock shadow to him and some gravel ground as well. CAS... this image fit that bill for a masculine card. We hope you come and play along with us and remember that you can use ANY image! Earn you badge and free digi at the Hoedown!! Also, if you missed the special birthday blog hop yesterday for Monica, the owner of Hambo Stamps, be sure to check out the details here!! Thanks so much for stopping in and have a great Wednesday! It's a Surprise Birthday Hop for Monica Hunter! Monica is the owner of Hambo Stamps and today is her birthday. The Bacon Bits Design Team got together and decided to throw a little surprise party for her, and we would like you to join us! If you are starting here, you are in the right place. We don't want you to miss out on any party fun. Every birthday has to have presents, and this one has one for you! One random hopper that completes the hop and comments on each blog will receive a Hambo Birthday surprise! The winner will be announced at the Hambo Hoedown on Wednesday, August 21. 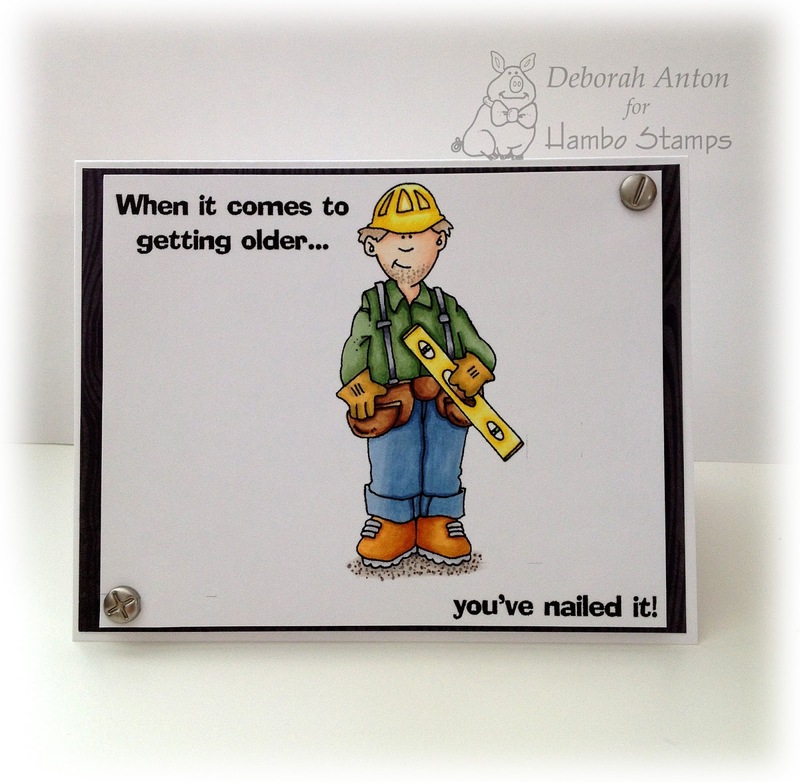 For my card, I used Hambo Stamps (of course!) Caveman and How Old sentiment. I colored him in with Copics and used some Basic Grey dp in their Ambrosia collection. I used some enamel dots for the top corner and some ribbon along the center before popping up the image. Now hop on over to Janes blog for more birthday fun! Have a great day! I had some dp from Webster's Pages that I never cut into but I really liked. This worked out perfectly for this challenge. Because the patterned is flowery, I didn't want to compete with that, so I kept the layout fairly simple. I used July's release of Anemones rock n rolled stamped with Memento Desert Sand and Rich Cocoa. I used some Distress Stickles in the center and stamped the sentiment using Memento Potters Clay. I popped that over some brown lace and cream ric rack and finished it off with some bronze pearls. Be sure to stop by and check out the other fabulous creations by the Timeless Tuesday Team!! Have a great day and thanks for stopping by. Welcome to another Timeless Tuesday Challenge! Today we have a fabulous guest host, Angela Rivera! Her challenge is to create a background using your stamps. There is so much you can so using your stamps as the background and I knew just the set I would use for my card. Flourishes July release of Popsicles and Pinwheels! I just love this set and see it being used often. I made a circle tag with the stamped sentiment, "Blowing you wishes" and also outlined that tag with some stickles before finishing it with some sheer white ribbon and jute twine. I did outline the 'wishes' with my Spica pen in yellow. For an additional texture, I added a few rhinestones throughout the background. Come play along and be sure to check out the other wonderful creations from the Timeless Tuesday Team, as well as our August Guest Designer!! Thanks for popping in and have a great day!! I've been home from vacation for 4 days and I have worked like crazy to get the home caught up. Nature decided to take over while we were gone, so there was much gardening to do along with basic housework. How many weeds does one home need? Those suckers just know when you decided to leave and they have a party; which seems to leave you with its offspring. I felt like some of them were talking to me like the Venus flytrap in Little Shop of Horrors. "Feeed meee Seymour!" Feed you? Certainly! With some of this weed killer... Oy vey! And then there are the bugs. Oh the bugs! The ground beetles, the little "what is that bug? ", and various other bugs having fly overs. Someone needs to let them know they are not the Air Force and there is nothing fabulous about them. I just might look and marvel at them when they fly with some red, white, and blue smoke from its rear. Until then, they will have to continue meeting my bug swatter. Without my ramblings of my housework, I think you all get my drift of how this homecoming worked out for me. I may have to rethink a long vacation next time! Okay! With all of that finally done, I can create guilt free this weekend! :) To start, I am applying for Your Next Stamp's DT call and I am sharing with you some of my best work. The styles are all different, but I like variety. Keeps ya on your toes. Hopefully, YNS does too! lol! I just love YNS with their whimsical style and cuteness! I will keep my fingers crossed and hope for the best. Wish me luck!